MULTIPLICATION TABLE: I created this easy to follow, colorful multiplication table because a colorful table wasn't easily available for download. 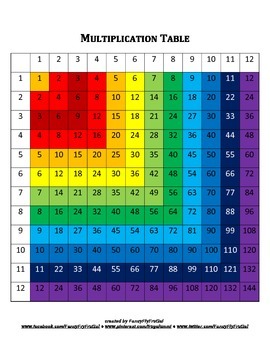 The colors make it easy for young math learners to memorize their basic multiplication facts. This is my most popular item; it was downloaded over 100 times for free before I decided to charge a nominal fee for it. Laminate this product for durability and repeated use.